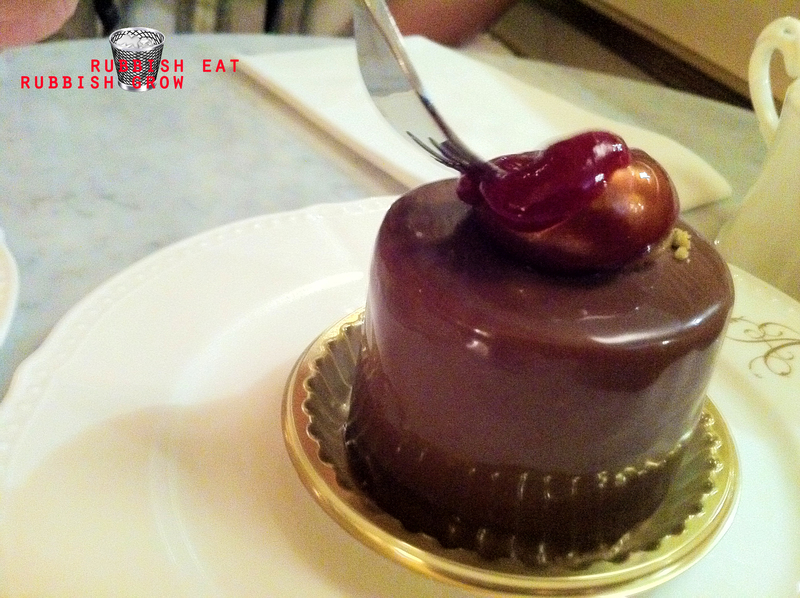 I used to go to Canele for desserts two, three times a week. So when the former Canele Pastry Chef Pang Kok Keong opens Antoinette, I’ve been wanting to go for ages. 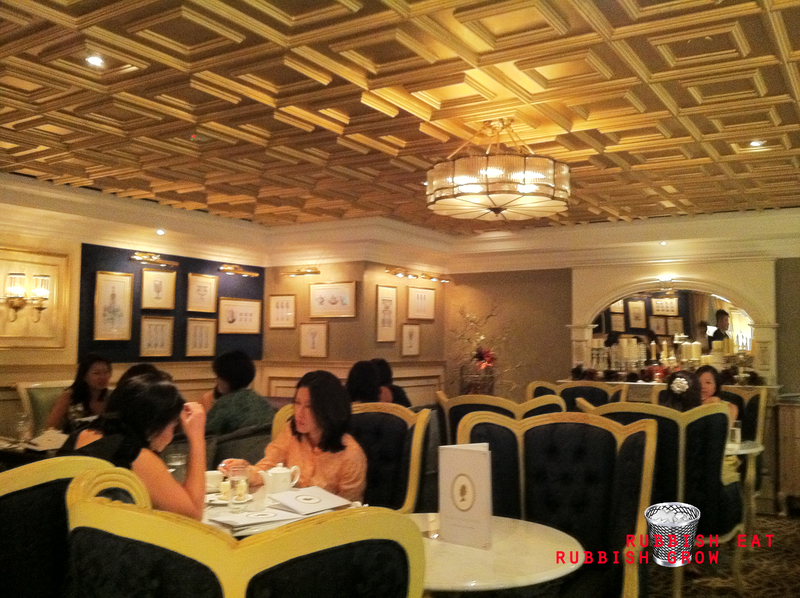 Dove into this gorgeous little enclave on a weekday afternoon, decorated like a royal palace with gold ceiling. We were surprised to see it so packed with taitais and were equivocal about the ambience. On one hand, it feels very luxurious and it is so easy to sink deep into the midnight-blue plush armchairs. On the other, the place is ridiculously ostentatious and absurd for Singapore. If this cafe were more campy, more into poking a joke of its seriousness, then it will be more fun, more like a farce. But right now, I suspect it is just artificial. But it’s still comfortable. Because the Strawberry Shortcake ($8) is one of the simplest and most basic cakes to make, it is a true test of how good the cafe is. There are two ways to make a cake: to make it dense like Germans, or make it light and ethereal like the Japs. The Strawberry Shortcake belongs to the second category. Antoinette is definitely and infinitely better than One Caramel and I’d even go as far to say that it is almost as good as the Japanese Flor Patisserie. Almost. I think the skills are already there but the freshness of the ingredients is missing. Considering the price of the cake, and comparing the price to Flor Pastisserie, Antoinette could have used fresh cream for the cakes or better quality of strawberries. 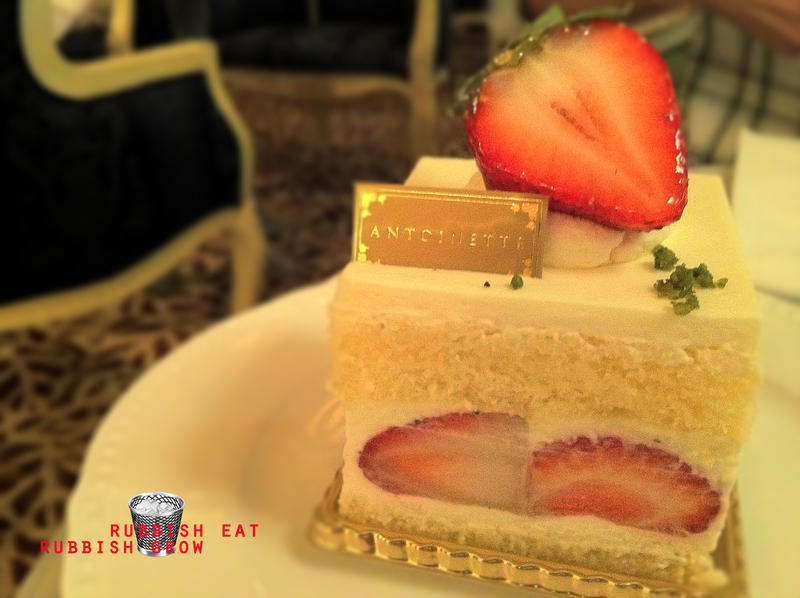 How to eat the Antoinette cake ($9). 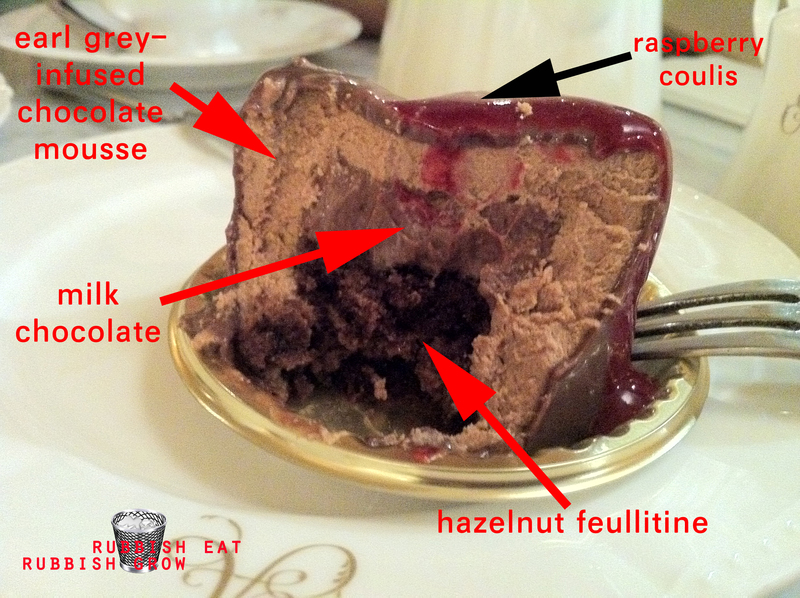 The three different layers give the cake a very intricate flavor. The earl grey emits a certain fragrance and a slight bitterness to counteract the sweetness of milk chocolate and the slight sourness of raspberry coulis. 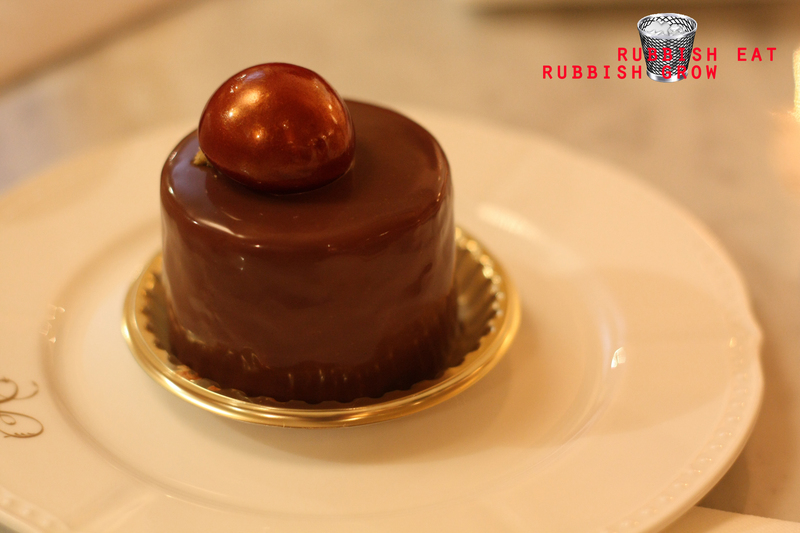 The brittle biscuit texture of the hazelnut feullitine contrasts beautifully with the softness of the mousse. Every ingredient compliments with each other. I think it’s quite original but I also wonder if it is too “safe” and if it’s created to be pleasing. There are a hot waiter (meow!) and an ah-beng manager. They are efficient, but while I don’t think they are inattentive, they are quite careless. For example, the ah-beng manager was clearing the table a few tables from a lady customer. She tried to get his attention four times, she raised her hand four times, but he didn’t see. Still, OMG, OMG, OMG when we left, Chef Pang saw us out and said goodbye to us!!!! So excited!!! Almost peed in my pants. Antoinette has definitely taken over Canele for me. I think I’d definitely return but I don’t think it will be as regular as I go to Canele. 2 teas and 2 cakes, costing $40, is definitely a luxury for me. As a general rule I can find something positive to say about every dining experience in Singapore, ANTOINETTE is the exception. A recent visit to this eatery was a true disappointment. Our meal began with luke warm cups of watered down “hot” chocolate that resembled the real thing in color only. Further, while our orders–French Onion soup, Nordic Crepe with Smoked salmon, and French Toast– arrived promptly, we quickly wished they had not come at all. The French Onion soup, with strange cheese hat and vinegary broth, could not have tasted worse had it come from a can. Three spoons was more then enough of this soggy bread ladened mess. The Nordic crepe, which we returned to kitchen after one bite, contained salmon which tasted as though it had gone off earlier in the week. The crepe was as crispy as a taco shell, and bore no similarity to a real crepe. Interestingly, the staff charged us full price, over our objections, for this item because we had tasted it, as if there was some other way to know that it was bad. The French Toast, while eatable at least, was only passable. Needless to say, we left our food largely untouched, and went in search of good food elsewhere. Luckily, in Singapore you don’t have to go far.